After all the excitement of the Let It Go! party, you might be forgiven for thinking that was it for another year, at least as far as The Twinkles are concerned. In fact, the party was but a prelude for the Main Event, the actual birthday, which was yesterday. My first thought had been not to wrap up our present - an easel from the Early Learning Centre - but to drape a sheet over it which could be whipped off at the appropriate moment, to reveal the exciting present hidden beneath. 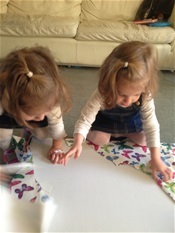 Then, as is my wont, I thought again, deciding what fun it would be to see the girls unwrapping such a mega present. Oh, how (literally) ripping! Obviously I had failed to think through some of the obstacles in the way, the most difficult of which involved actually wrapping up a four foot long box. It took two rolls of wrapping paper (specially chosen to fit in with the party's butterfly theme) plus a good half an hour wrestling with box, paper and sticky tape. Mr B looked on with barely disguised amazement at my contortions. You could tell he would have gone with the Sheet Option. The next difficulty was man-handling the bulky parcel into the car without tearing the paper so lovingly wrapped around our present. It fitted exactly, with barely an inch to spare. I always reckon that Fortune Favours The Brave. Or the Foolish. It was a good feeling, knowing that I could depend on the Son In Law to remove the parcel from the back seat when we arrived at our destination. Even though it was, undoubtedly, large when he would prefer small. It was worth all the effort to see The Twinkles set to with a will to strip the paper from their present. The Rascal was at playgroup which was probably a Good Thing, allowing his sisters to discover their present without his "help." I don't blame him for a minute for believing it must be his birthday too. Let's face it, he is one of A Trio - but the only one who isn't celebrating a birthday. No wonder he is confused. It would have been lovely to have a little longer with the family - but we packed a lot into our morning. We watched Tala and Lila on their new scooters, presents from their Proud Parents. I reminded their mum, the Middle of the Darling Daughters of her first scooter when she was only a little bit older than her own daughters. : "You have to leave one leg off," she told me, seriously. Both Twinkles, I was pleased to note, had mastered the Art Of Leaving One Leg Off. Just before twelve noon, we set off to walk through the woods to collect The Rascal from playgroup. We didn't have time to clear up the 150 + magnetic alphabet letters we had bought to accompany the easel which were spread all over the floor. At least, I comforted myself, they were small. I'm sure the Son In Law can only approve, size-wise, even if he may express doubts about their Sheer Scatterability. I loved traipsing through the woods, holding hands with The Twins, kicking up the Autumn leaves and making "oooh! oooh!" noises as we walked through the tunnel under the road. (The Twinkles, original as ever, call it the Da Tunnel.) I loved seeing Young Faris's face when he found me waiting for him with all the other parents and grandparents. I don't think he was expecting me. Most of all, I loved seeing a whole line of his friends at the playgroup window waving him goodbye. My sweet, sometimes wilful, always quirky Rascal is clearly Popular Among His Peers. All good things come to an end - even birthday visits. After a quick, but tasty, lunch we were on the road again, Mr B and I, and bound for home.